It’s down to the final three dining adventures from my Boston trip! I’ve got a visit to a trendy dining hot spot to share and a visit to an Italian deli and grocer also. But first, I’ve got to tell you about the delectable cupcake I had at Sweet! 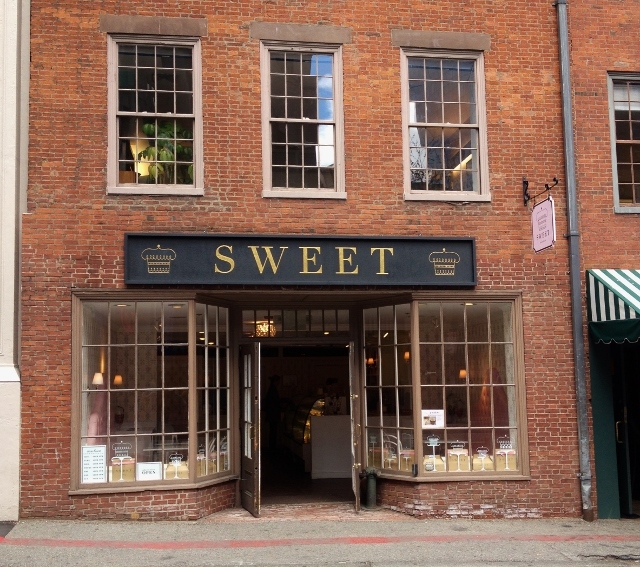 There are several locations of Sweet in the Boston area. We visited the Downtown location on School Street. From the outside, it’s already apparent what an adorable little bakery awaits inside! 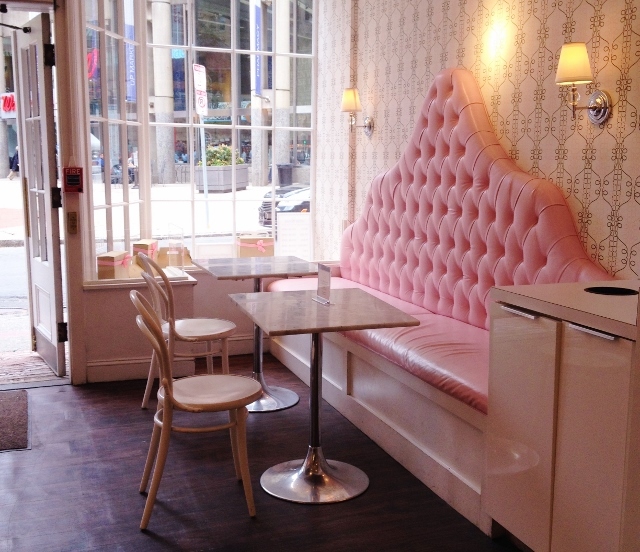 Inside, it’s white and pink and girly all over. My fella probably felt a bit out of place here, but it didn’t stop him from indulging in cupcakes and coffee. About the cupcakes: gluten-free cupcakes are offered in a two-pack, sealed in a clamshell container so there is no cross-contamination. Not gonna name names here, but just down the way on Washington street there is another cupcake shop. They, too, have “gluten-free” cupcakes. I use the quotation marks because at the other cupcake shop, they have their “gluten-free” cupcakes on a cake stand, right beside cupcakes full of gluten. Yikes! This isn’t the case at Sweet! They’ve done it up right, keeping the gluten-free cupcakes in their own safe little box on the top shelf so no gluten-full crumbs fall onto the box. 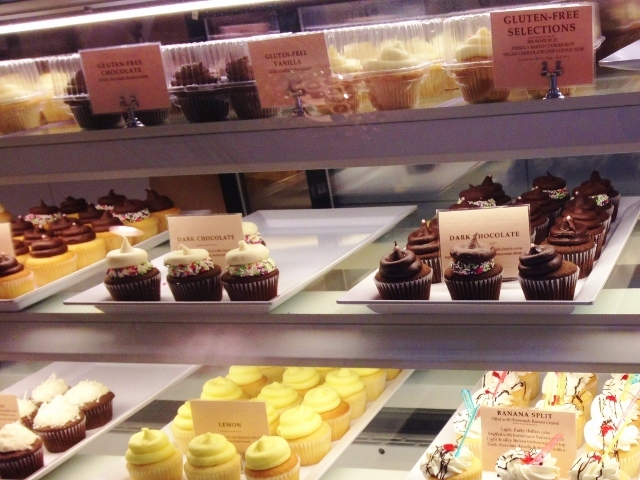 Not only that, the gluten-free cupcakes at Sweet at baked by Glutenus Minimus, a dedicated gluten-free bakery. A small selection of other gluten-free treats was also available, but we only tried the cupcakes, sold in a two-pack which was perfect for us. We had chocolate cupcakes with chocolate frosting. I liked the cake-to-frosting ratio, just enough frosting to have a little bit with each bite of cake. The cake was terrific, not a crumbly mess, a nice texture and the frosting had a nice dark chocolate flavor to it without being overly sweet. Good stuff here! The bakery was a nice stop along the Freedom Trail to rest our feet for a few moments and get a little injection of sugar and caffeine. I’ll definitely stop here on my next trip to Boston! Eat With: Minimal Caution. At the time of my visit, gluten-free sweets were in clamshell containers, sealed away from cross contamination and baked in a dedicated gluten-free facility. The staff were super helpful and very knowledgeable about their gluten-free offerings. 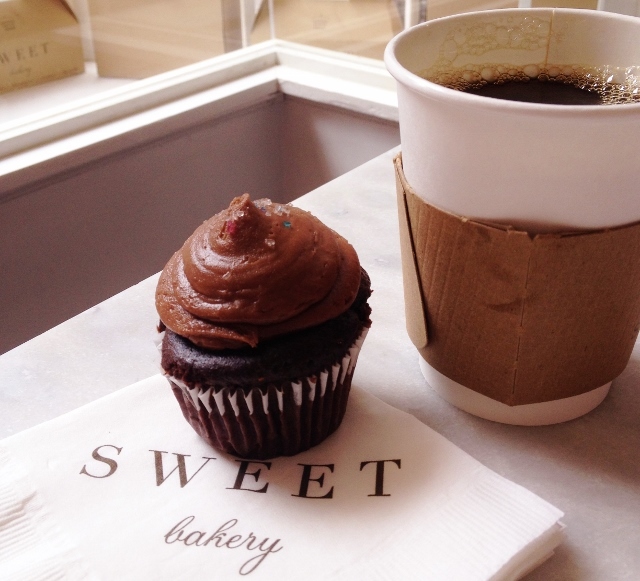 The location of Sweet visited in this post is located at 11 School Street, Boston, MA 02108. 617.227.CAKE.